Managing packaging specs got you down? Frustrated with not being able to find the right packaging specs you need when you need them? Tell us all about your frustrations and your wishes for the best solution to manage packaging specifications by taking part in our packaging spec management survey. By helping us to learn more about your needs, you’ll also have the opportunity to be entered to win a $100 Amazon gift card. We’ll publish the results on our blog as soon as the survey is closed. 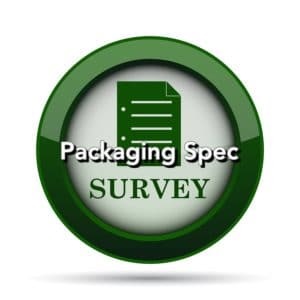 Feel free to share this important industry survey with colleagues in your company or suppliers so we can create a complete picture of the way packaging specifications are managed today. Just click the link below and complete the survey.